One of the first league initiatives I learned about was one to bring fair districting to our state. That was 45 years ago. The league’s work never stopped, through Democratic governors and Republican governors. Within Democratic-controlled legislatures and Republican-controlled legislatures. Consistency. Relentlessness. The league’s efforts – your efforts — were indispensable to securing the ballot issue of November 2015, a state constitutional amendment providing Ohioans with a historic reform of how we draw state legislative districts. It was that success that provided the essential momentum for securing the ballot issue we face next month, giving Ohioans the opportunity to embrace a historic reform of how their state draws congressional districts as well. All of us have an obligation to keep working through May 8 to ensure that State Issue 1 not only gets over the finish line, but that it wins with a sizable majority – as Beth Taggart has reminded me, and Ann Henkenerhas just reminded all of us – so that all future legislators are reminded of to their moral obligation to stick to the rules when drawing congressional district lines. The Ohio Democratic Party and the Ohio Republican Party have officially endorsed State Issue 1. Please give not only yourselves – but especially your countless predecessors – a round of applause for this historic achievement. It has only taken the entire history of our state of Ohio to get to this moment. 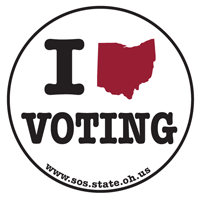 Ohio has 9.3 million eligible voters, of whom 7.7 million are registered to vote in the Nov. 8, 2016 election. Secretary of State Jon Husted has mailed notices to the 1.6 million eligible but unregistered Ohioans that they have until Oct. 11 to register for this year’s hotly-contested presidential election. With so much attention given voter registration today, it might surprise many Ohioans to learn that, prior to 1978, our state did not have a statewide registration requirement. From adoption of Ohio’s first voter registration law in 1885, it took 93 years for the state to adopt legislation that applied the same standard across all 88 counties. Three decades into statehood, Ohio lawmakers began debating the need for a voter registration law. However, in 1837, the House Judiciary Committee recommended against it because it would be “impracticable in a new and rapidly settling country” where the population was constantly changing, wrote David M. Gold, author of Democracy in Session: A History of the Ohio General Assembly. Without registration requirements, voters simply showed up at their neighborhood polling place, signed and addressed poll books, and showed a piece of identification when requested. Like many states, Ohio grew more serious about voter registration after the Civil War, as large numbers of citizens moved from farms to cities. On May 4, 1885, the legislature passed a law requiring registration of voters in Ohio’s two largest cities – Cincinnati and Cleveland. The law required the two cities to create wards containing no more than 300 voters in each, and to appoint “voter registers” – one from each major party in each precinct – to supervise registration. Those registering were required to list name, address, age and marital status. However, eight months later, the Ohio Supreme Court declared the law unconstitutional because it provided only seven days for registration. The court ruled the General Assembly has the power to adopt a registration law, but not one so restrictive. The court laid down a balancing test that Ohio has struggled to meet ever since: “We believe it is an easy task to frame a registry law that, while protecting the election from fraudulent votes, and securing the integrity of the ballot, will in no practical way impede or injuriously restrain the constitutional right of the voter,” the court instructed. The next year, the legislature passed a law giving control of elections in Ohio’s major cities to boards of elections. The General Assembly also began to set population thresholds at which cities would be required to register voters, allowing local boards of elections to determine the length of registration periods. For much of the 20th century, voter registration was not required until a municipality reached a population of 16,000. In larger population counties, municipal boards of elections gradually were consolidated into county boards of elections. However, as recently as 1952, only 17 of Ohio’s 88 counties were “full registration” counties, and an additional 18 were “partial registration” counties. That left 53 counties without any registration requirement. By 1972, 53 counties had adopted countywide registration, seven had partial registration, and 28 still had no registration requirements. Perhaps the biggest voter registration fight in Ohio history occurred in 1977. In control of both houses of the General Assembly, Democrats overrode a veto by Republican Gov. James A. Rhodes and enacted legislation establishing election-day and permanent registration statewide. The law removed a 30-day precinct and county residency requirement. At the time, boards of elections in registration counties removed people from the voting rolls if they failed to vote in any election for two successive years. Such voters would be mailed postcards informing them of the need to re-register – in person. Republicans wasted no time in challenging the law. The GOP led an initiative petition campaign, gathering 365,985 valid signatures to place what became State Issue 1 on the Nov. 8, 1977 ballot. Approved by a 62-38 ratio, the amendment repealed election-day and permanent registration, established a 30-day, statewide registration requirement effective in 1978, and required re-registration if a voter failed to vote at least once in a four-year period. For the first time, Ohio had a standard statewide voter registration requirement, effective for the Nov. 7, 1978 election. As of Jan. 1, 1979, the Ohio secretary of state was required to maintain a master list of registered voters, compiled from the 88 county boards of elections. The state also began allowing registration by mail. Earlier this year, the General Assembly approved a bill to provide for online voter registration and re-registration. However, the law does not take effect until next year. The march of technology almost certainly ensures an ongoing debate over how best to balance an unrestrained right to vote with ballot integrity. Curtis B. Gans, the co-founder and longtime director of the Center for the Study of the American Electorate, who died last year, in 2009 urged Congress to consider the merits of government-issued, biometric ID cards for everyone 18 and over. Such cards, Gans reasoned, not only would eliminate the need for state-by-state voter registration, but could ensure a fully accurate federal census, and provide secure ID for medical records, Social Security, Medicare, driver’s licenses and more. Columbus native Michael F. Curtin is currently a Democratic Representative (first elected 2012) from the 17th Ohio House District (west and south sides of Columbus). He had a 38-year journalism career with the Columbus Dispatch, most devoted to coverage of local and state government and politics. Mr. Curtin is author of The Ohio Politics Almanac, first and second editions (KSU Press). Finally, he is a licensed umpire, Ohio High School Athletic Association (baseball and fastpitch softball). President Donald Trump cannot suppress a primal urge to fume over voter fraud. Nearly everyone with expertise in elections, to say nothing of psychotherapy, sees emotional need shouting over the hard evidence. To find widespread voter fraud, on the scale alleged by Trump, we need to turn back the clock a century or more. There was no better place to find it than in Ohio. And here, no better place than in rural, southern Ohio – especially Adams County. The 1890s marked the height of boss rule and machine politics in Ohio. In that era, the most common form of voter fraud was the outright buying and selling of votes. In the saloons and betting parlors of Cincinnati, Cleveland and Columbus, a man easily could pocket a few dollars by promising a precinct committeeman to vote the right way in an upcoming election. The practice was open and widespread, and regularly denounced by civic reformers such as Washington Gladden of Columbus, Tom L. Johnson of Cleveland and Samuel M. Jones of Toledo. As flagrant as vote-buying was in the big cities, on a percentage-of-the-electorate basis, it was far more extensive in the hardscrabble counties of southern Ohio, which were almost entirely white and agricultural. The best-documented case of all is from November 1910 in Adams County, home of white burley tobacco. Following that election, 1,690 men – 26 percent of the voting population – were found guilty of buying and selling votes. As early as 1885, the practice was flourishing. “So entrenched was the employment of boodle that Adams County electors regarded it as rightful compensation for time spent going to the polls,” wrote Genevieve B. Gist. Her study, “Progressive Reform in a Rural Community: The Adams County Vote Fraud Case,” appeared in the June 1961 edition of The Mississippi Valley Historical Review. Party leaders occasionally attempted a truce to stop the practice, only to cave to pressure from expectant voters. Party leaders found themselves in a Catch-22, finding it difficult to recruit men willing to run for office “since a candidate had to pay into the party coffers a sum equal to a year’s salary to aid in financing the boodle,” Gist wrote. Still lacking the vote, women active in the Women’s Christian Temperance Union began agitating for reform. They found a willing reformer in Adams County Common Pleas Judge Albion Z. Blair, who admitted past participation in the fraud. On Dec. 13, 1910, Blair empaneled a special grand jury to examine the previous month’s election. He ordered the sheriff to post notices urging the guilty to come forward before arrest warrants were issued. According to Gist, Blair knew many by name, and his method was informal. “How about it, John, are you guilty?” he would ask. The spectacle attracted national attention, including a front-page story in the Christmas Day 1910 edition of The New York Times. Blair imposed tougher financial penalties on the affluent. Some appealed their five-year voting bans. But on March 7, 1911, the Ohio Supreme court upheld their constitutionality. Columbus native Michael F. Curtin is formerly a Democratic Representative (2012-2016) from the 17th Ohio House District (west and south sides of Columbus). He had a 38-year journalism career with the Columbus Dispatch, most devoted to coverage of local and state government and politics. Mr. Curtin is author of The Ohio Politics Almanac, first and second editions (KSU Press). Finally, he is a licensed umpire, Ohio High School Athletic Association (baseball and fastpitch softball). For the first time in nearly two generations, Ohioans will be unable to witness the candidates for top statewide offices engage in public debate. This should be deeply troubling to voters of all political persuasions. Newton N. Minow, former chairman of the Federal Communications Commission, perhaps best explained the case for debates in an October 2012 column published in The New York Times. In classrooms throughout Ohio and the nation, grade-school and high-school students are encouraged to debate because debates sharpen reading, researching, writing and thinking skills. For officeholders and candidates, agreeing to engage in debates is the highest form of acknowledging the vital importance of accountability and transparency in our democratic form of government. Yet, in a historic departure from civic responsibility, four of the five 2014 Republican candidates for statewide executive office (and one Democratic Congressional candidate) have refused to debate their opponents. “That’s shameful and it furthers the likelihood that the messages heard in this campaign will be from the candidates who have the most money to spend,” editorialized The Newark Advocate. In the race for governor, Gov. John R. Kasich will spend several dollars in TV advertising for each vote he receives on Nov. 4. No complaint, there. That’s modern-day campaigning. The supremacy of money continues. But, at the same time, to flatly refuse debate offers from Ohio’s major newspapers, television stations and good-government groups is a show of disrespect – even contempt – for the voter. Without debates, “the big loser will be the public,” WKYC-TV concluded. Over the decades, new ways of campaigning develop and eventually become the norm. We can only hope that 2014 does not mark a turning point in Ohio politics, and that refusing to debate becomes routine. On Nov. 3, 2015, Ohioans voted to end the blatant gerrymandering of the state’s 132 state legislative districts – 33 Ohio Senate districts and 99 Ohio House districts. This welcome opportunity arrived because, in December 2014 – after many decades of partisan stalemate – Democrats and Republicans in the Ohio General Assembly forged a compromise plan to put before Ohio voters. Unfortunately, the lawmakers stopped short of putting forth a companion plan for ending the gerrymandering of Ohio’s 16 congressional districts. Ohio is one of many states in which good-government organizations for decades have been advocating an end to gerrymandering – the art of drawing meandering, misshapen districts to ensure noncompetitive elections and, as a result, one-party dominance that ignores overall vote totals. The U.S. Constitution, to ensure equal representation by population, requires congressional and state legislative districts be redrawn once every 10 years after completion of a new U.S. Census. Over the decades, both major parties in Ohio and other states – when in control of the offices that draw the maps – have abused their authority. In 2010, Democrats in control of the Ohio House of Representatives shunned a widely-acclaimed reform plan approved by the Republican- controlled Ohio Senate. Why? Because Democrats then controlled the offices of governor and secretary of state, and wrongly assumed they would retain control after the November 2010 elections. Over time, especially with the advent of computers and sophisticated map-making software, the abuses have become more and more flagrant. As a result, at no time in Ohio history have the congressional and state legislative maps been as blatantly gerrymandered as the maps now in place until the 2022 elections. For example, one of the most bizarre districts in American history is Ohio’s 9th Congressional District, which snakes across the Lake Erie shoreline from Toledo to Cleveland. When it comes to our collective attempts to foster good government – honest, open, responsible government – there have been few barriers as persistent, as corrosive and as detrimental to that goal as the blatant gerrymandering of congressional and state legislative districts. When John Adams, in 1780, was writing the Constitution of Massachusetts, he called for the creation of compact, contiguous districts that would not unduly split towns or wards, and that would protect communities of interest. Despite Adams’ warnings, by 1811 political opportunism trumped political piety in that state. That occurred when Massachusetts Gov. Elbridge Gerry (pronounced GARY) went along with members of his party and signed a redistricting bill to favor the Democratic-Republicans and to weaken the Federalists – even though the Federalists, as the majority party, collected nearly two-thirds of the votes cast in the next election. Massachusetts was left with many odd-shaped congressional districts, and the practice of gerrymandering was off to the races. The practice was no stranger to Ohio. In the late 1870s and into the 1880s, Ohio politicians redrew our state’s congressional district lines six times in seven election cycles. One of Ohio’s most famous politicians, William McKinley, in 1890 lost re-election to Congress primarily because of gerrymandering. The following year – 1891 – statewide elections in those days were in odd-numbered years – McKinley was elected governor of Ohio. In his inaugural address of January 1892, he took the opportunity to strongly condemn the practice of gerrymandering, which he had painfully experienced. Gerrymandering was getting enough of a bad rap that by 1901, Congress passed a law to require that districts be compact. However, subsequent violations of that requirement routinely were ignored. Unfortunately, there are no federal standards that apply to political gerrymandering, except that districts have nearly equal populations. There are federal standards that apply to racial gerrymandering, but not partisan gerrymandering. So, without a federal standard, the constant battle to curb the evil of gerrymandering is a state-by-state battle. How is gerrymandering used to rig elections? “Imagine a state with five congressional seats and only 25 voters in each district. That makes 125 voters. “Sixty-five are Republicans; 60 are Democrats. You might think a fair election in such a state would produce, say, three Republican representatives and two Democrats. “Now imagine you can draw district boundaries any way you like. The only condition is that you must keep 25 voters in each one. “If you were a Republican, you could carve up the state so there were 13 Republicans and 12 Democrats per district. Your party would win every seat narrowly. Republicans, five-nil. “Now imagine you were a Democrat. If you put 15 Republicans in one district, you could then divide the rest of the state so that each district had 13 Democrats and 12 Republicans. Democrats, 4-1. Same state, same number of districts, same party affiliation; completely different results. That is gerrymandering. It is discriminatory districting, practiced to inflate one party’s strength and dilute the opposing party’s strength. The odd shapes result from drawing lines designed to pack as many voters of the opposite party into as few districts as possible, leaving a majority of districts to be won by the party controlling the mapmaking process. 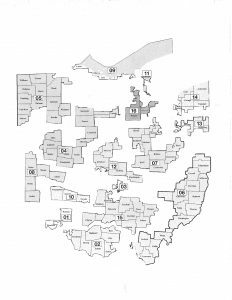 At present, Ohio’s state legislative districts are drawn by the five- member Apportionment Board, which is controlled by the governor, auditor and secretary of state. Congressional districts are drawn by the Ohio General Assembly. The plan approved by Ohio voters on November 3, 2015 would replace the Apportionment Board with a seven- member Ohio Redistricting Commission, and require that any plan adopted by the commission have the support of at least two members of each of the two major political parties. The plan also includes more explicit map-making standards designed to minimize the splitting of counties, cities, townships and wards. If successful, the plan would end the drawing of crazy-looking districts that are anything but compact. At present, there are no plans to ask Ohio voters to adopt a plan to reform congressional redistricting. Republicans who control the Ohio General Assembly said such a plan should await a ruling by the U.S. Supreme Court on the constitutionality of the Arizona Independent Redistricting Commission. Arizona’s Republican leaders challenged the constitutionality of the commission, arguing that the U.S. Constitution gives state legislatures exclusive authority to draw congressional districts. On June 29, 2015, the Supreme Court, in a 5-4 ruling, upheld the Arizona plan. The ruling held that a state’s legislative authority includes the electorate taking advantage of the initiative process. Ohio is one of 15 states to limit the number of terms its state lawmakers can serve. However, this is a relatively recent development. For most of its history, Ohio imposed no limit on the longevity of state legislators. In the early 1990s, national conservative and libertarian organizations initiated ballot issues in more than 20 states to limit the terms of U.S. senators, U.S. representatives, state senators and state representatives. The high-water mark of this movement was 1992. On Nov. 3, 1992, voters in Ohio and 14 other states decided term-limit issues. State Issue 2, approved by 66 percent of the voters, limited U.S. senators from Ohio to two successive terms of six years, and limited U.S. representatives from Ohio to four successive terms of two years. State Issue 3, approved by 68 percent of the voters, limited state senators to two successive terms of four years, and state representatives to four successive terms of two years. State Issue 4, approved by 69 percent of the voters, limited the lieutenant governor, secretary of state, treasurer of state, attorney general and auditor to two successive terms of four years. At the time, most Republican and conservative organizations nationally and in Ohio supported the term-limit issues. Most Democratic and liberal organizations either opposed the issues or remained neutral, recognizing the overwhelming support the issues had in public-opinion polls leading up to the election. However, the voter-approved limits on U.S. senators and U.S. representatives never took effect. Term-limit opponents filed lawsuits challenging the constitutionality of states setting limits on the tenure of federal officeholders. On May 22, 1995, the U.S. Supreme Court, in the case of U.S. Term Limits v. Thornton, by a 5-to-4 decision, ruled that states cannot impose qualifications for prospective members of Congress that are stricter than the qualifications specified in the U.S. Constitution. With that decision, the U.S. Supreme Court invalidated congressional term limits in 23 states. Left standing, however, were voter-approved term limits applicable to state executive officeholders and state lawmakers. Ohio’s new term limits restricted all statewide officeholders and state legislators to no more than eight consecutive years in office. Because the state constitutional amendments were approved in November 1992, to take effect in January 1993, and because laws cannot be made retroactive, that meant any Ohio statewide official or legislator in office as of January 1993 could not serve beyond Dec. 31, 2000. Prior to adoption of these amendments, the only Ohio statewide office with a term limit was the office of governor. On Nov. 2, 1954, Ohio voters (55 percent to 45 percent) approved a state constitutional amendment to establish four-year terms for governor, lieutenant governor, attorney general and secretary of state, and to limit the governor to two successive terms. The Ohio Supreme Court later interpreted the amendment to allow a former governor to run again for governor after being out of office for four years. Similarly, the amendments approved in 1992 allow officeholders to run again for the same office, as long as they have been out of office for at least four years. The debate over term limits is as old as the republic, although the popularity of term limits is largely a modern-day phenomenon. In 1781, the Articles of Confederation limited delegates to the Continental Congress to three years of service in a six-year period. This thinking, which traces back to ancient Greece, is rooted in the philosophy that those who govern should be reminded that they soon will return to the ranks of the governed. However, the framers of the U.S. Constitution considered and rejected term limits for members of Congress. This thinking is rooted in the philosophy that frequent elections give the people sufficient opportunity to oust officeholders. The Founding Fathers also imposed no limit on presidential terms, although for many decades it was customary for presidents to serve for only two terms. Following the fourth consecutive presidential victory of Franklin D. Roosevelt in 1944, Congress moved to establish a two-term limit for presidents. On March 21, 1947, Congress passed an amendment, to submit to the states for ratification, declaring, “No person shall be elected to the office of President more than twice . . .” The ratification process was completed on Feb. 27, 1951. The modern-day popularity of term limits correlates strongly with voter disgust over official misbehavior, scandals, legislative gridlock, and highly-negative, highly-partisan campaigning and governing. The study concluded that approximatey two-thirds of Ohioans believe that term limits have fostered good government and improved the state. Interestingly, the study also found that those closest to state government – officeholders, lobbyists and those who study the workings of state government – are strongly critical of term limits. About three-fourths of the close observers of state government would favor the repeal of term limits, the study found. These close observers believe that term limits have weakened the legislative branch and increased the power of special interests, which are believed to have more expertise than relatively inexperienced legislators. Critics of term limits believe that state government is a complex business with many complex issues, and that it takes years for lawmakers to develop the necessary expertise to effectively evaluate policy alternatives. There is no question that term limits guarantee an inexperienced legislature. When the 124th Ohio General Assembly convened in January 2001, nearly half of the previous legislature – with 211 years of combined experience – were gone. Prior to 2001, Ohio was among the states with the most experienced legislatures. Today it ranks among the states with the least experienced legislatures and the highest turnover rate of lawmakers. With such a wide gap between the views of the general public and those of close observers of the Ohio legislature, some analysts have begun to explore the possibility of asking the electorate to extend term limits to 12 years, from the current eight, rather than asking voters to eliminate term limits altogether. The Bliss study found that about one-third of Ohioans who support term limits say they would consider extending them to 12 years. The 32-member commission, created in 2012 by the state legislature, is charged with analyzing proposed changes to the Ohio Constitution and making recommendations to the General Assembly. The commission, composed of 12 state legislators and 20 persons appointed by those 12, can forward a recommendation for constitutional change to the General Assembly only if the the proposal obtains a two-thirds favorable vote. Like any proposed amendment to the Ohio Constitution, a proposal cannot go on the statewide ballot unless it receives a three-fifths favorable vote in both the Ohio Senate and the Ohio House of Representatives. Regardless of one’s personal opinion on term limits, it is clear that the issue will continue to receive considerable scrutiny in the near future, and the General Assembly will debate whether and when to ask voters to change the current eight-year limit. Columbus native Michael F. Curtin is currently a representative (first elected 2012) from the 17th Ohio House District (west and south sides of Columbus). He had a 38-year journalism career with the Columbus Dispatch, most devoted to coverage of local and state government and politics. Mr. Curtin is author of The Ohio Politics Almanac, first and second editions (KSU Press). Ohio could benefit from a state constitutional revision commission. The state last utilized such a panel in 1971-1977. It was a success. The commission recommended 18 constitutional amendments, 15 of which were adopted by Ohio voters. Tax reform, including classifying real property for tax purposes and taxing agricultural land at current value. Ballot reform, by creating the Ohio Ballot Board to ensure uniformity and requiring the rotation of candidate names on the ballot to ensure fairness. Executive branch reform, requiring election of the governor and lieutenant governor in tandem, and establishing an order of gubernatorial succession. Enfranchisement reform, conforming Ohio law with the federal law granting 18-year-olds the right to vote. County government reform, establishing a permissive, alternative form of county government. Ohio faces plentiful challenges. Some of them cannot be solved without changes in the state constitution. Adopted in 1851, it is one of the oldest state constitutions in America and contains many antiquated provisions. A top-level, bipartisan commission, comprised of state lawmakers, academics and business and labor leaders, would educate and inform all Ohioans of potential reforms to better position our state for the challenges of the 21st century. Among other topics, the panel most likely would examine tax reform, state and local government reform, term limits, merit selection of judges and reapportionment reform. Ohio has not thoroughly examined its constitution, its basic governing document, in two generations. A new exam is overdue. Because of its success, the previous experience should be studied and emulated. In August 1969, Gov. James A. Rhodes and the General Assembly passed legislation creating a 32-member commission, including 12 state lawmakers. Ohio was rather late to the game, as the period of 1950-1970 gave rise to constitutional-reform movements in 45 states. There was widespread recognition that state constitutions contained many provisions that were outmoded. Ohio’s state leaders also recognized that, in 1972, voters would face the ballot question, which appears every 20 years, of whether to call for a state constitutional convention. Ohio’s constitutional requirement to ask the voters this question every 20 years follows Thomas Jefferson’s maxim that each generation should have the opportunity to choose its own form of government. The late 1960s were politically and socially tumultuous, and Statehouse leaders were concerned over the direction a constitutional convention might take. The commission was a way to take the steam out of any momentum for a 1972 convention call. Interestingly enough, the convention question will appear again in November 2012. Ohio has not had a constitutional convention since 1912 and doesn’t need one now. But it does need constitutional revision. The previous commission divided into committees (Executive/Legislative, Local Government, Finance and Taxation), met monthly and held hearings across the state. It published a newsletter to keep the public informed. The 12 lawmaker members, chosen by legislative leaders, were politically balanced: six Democrats, six Republicans; six Senate members, six House members. Those 12 chose the other 20 members, who were broadly representative of business, labor, the judiciary and academia. Political balance is a key to success, because no proposed amendment to the Ohio Constitution will be approved by the voters without wide support. With the previous commission, no proposal for a constitutional amendment could go to the General Assembly without the approval of two-thirds of commission members. To put a proposed amendment on the ballot, both houses of the General Assembly must approve it by a three-fifths vote. The commission was charged with completing its work by July 1, 1979. It actually finished early, delivering a final report to the General Assembly on June 30, 1977. Ohio still benefits from the work of that group. Another study commission, if carefully selected and politically balanced, most likely would produce timely benefits for Ohio. Mike Curtin is associate publisher emeritus of The Dispatch.